The wave of flood-insurance sticker shock that’s sweeping across the U.S. didn’t originate with Hurricane Sandy. But a year after the one of the most devastating storms in U.S. history, homeowners in Sandy-ravaged regions of the East Coast have been among the first to feel its impact — and loudly voice their protests. Even as those still rebuilding from the storm (pictured above battering the Rhode Island coast) complain of low-ball insurance payouts and government red tape, others are sounding the alarm about rate hikes that went into effect this month. Property owners who’ve already been buying federally subsidized flood insurance are seeing their rates go higher, sometimes very much higher. As maps of flood-prone areas are reevaluated and redrawn, they’re soon to be joined by many others in other flood-prone regions of the country — many of whom might not even know that they’re now at risk of flood — or of having to buy prohibitively expensive flood insurance. AOL Real Estate recently carried the accounts of those in newly designated “high-risk” flood zones as seeing their annual flood insurance premiums multiply from the hundreds into the thousands. And this past week at a meeting in Middletown, N.J., a local official decried the choice given hundreds of its citizens — between raising their homes to a higher elevation or paying higher insurance rates — as part of a “national Ponzi scheme” by the federal government. Middletown Patch further quoted officials there as saying that residents face insurance premiums of up to $31,000 a year if they fail to comply. In Mississippi, that state’s insurance commissioner filed a lawsuit in September to block the rate hikes, which he says could be as high as 3,000 percent, and in Florida, officials have pledged to file a legal brief in support. “The ripple effect that we’re going to be feeling in Florida and other coastal states, I don’t think anybody thought ahead about that,” Pam Dubov, the appraiser of Pinellas County, Fla., told The Associated Press. Meanwhile, Bloomberg reported Thursday that reassessed rates are sending a chill through the residential real estate market. “We were getting five or six showings a week,” it quoted Wendy Lockhart, a St. Petersburg, Fla., real estate agent as saying. “Then when all this started hitting the front pages about three weeks ago, we’ve had no showings.” Lockhart also told the news service that because her insurance premium rose “from about $1,000 to $8,105,” she’s now having difficulty selling her own home. The flood insurance rate hikes that went into effect on Oct. 1 were put in place by Congress months before Sandy struck — in reaction to disasters such as 2005’s Hurricanes Katrina and Rita that brought so many claims that the federally financed program to insure flood-zone properties faced insolvency. The Biggert-Waters Flood Insurance Reform Act, passed in July 2012, instructed various federal agencies to figure out how to keep the National Flood Insurance Program funded and running efficiently, and set a schedule of yearly insurance-rate hikes that would eventually eliminate the subsidized premiums for many property owners. It also called for updated maps of flood-prone regions. Although it passed easily, there’s now a movement in Congress to delay or alter Biggert-Waters, with even co-sponsor Rep. Maxine Waters of California expressing dismay at the level of rate hikes and urging that they be delayed. The head of the Federal Emergency Management Agency, which is running the program, also has told Congress that he’s concerned about the poor and middle class being “priced out of their homes.” But he said that FEMA’s hands are tied until Congress changes the legislation. FEMA’s FloodSmart website has links to local flood maps, including information about maps that are scheduled to be updated. The site also allows homeowners to determine their current risk levels as it directs them to agents selling NFIP policies in their areas. For those in flood zones, the slideshow below looks at the kinds of properties now affected by the Biggert-Waters Flood Insurance Reform Act. WASHINGTON — Average U.S. rates on fixed mortgages dropped this week to their lowest levels in four months, a positive sign for the housing recovery. Mortgage buyer Freddie Mac says the average rate on the 30-year loan fell to 4.13 percent. That’s down from 4.28 percent. The average on the 15-year fixed loan declined to 3.24 percent from 3.33 percent. Both averages are the lowest since June 20. Mortgage rates have been falling since September, when the Federal Reserve held off slowing its $85-billion-a-month in bond purchases. The bond buys are intended to keep longer-term interest rates low, including mortgage rates. And a slowdown in hiring in September makes it more likely that the Fed will continue its stimulus into next year. Former Countrywide executive Rebecca Mairone testifying before Congress in 2010. NEW YORK — Bank of America was found liable for fraud Wednesday over defective mortgages sold by its Countrywide unit, a major win for the U.S. government in one of the few trials stemming from the financial crisis. After a four-week trial, a federal jury in New York found the bank liable on one civil fraud charge. Countrywide originated shoddy home loans in a process called “Hustle” and sold them to government mortgage giants Fannie Mae and Freddie Mac, the government said. The four men and six women on the jury also found former Countrywide executive Rebecca Mairone liable on the one fraud charge she faced. The U.S. Justice Department has said it would seek up to $848.2 million, the gross loss it said Fannie and Freddie suffered on the loans. But it will be up to U.S. District Judge Jed Rakoff to decide on the penalty. Arguments on how the judge will assess penalties are set for Dec. 5. Any penalty would add to the more than $40 billion Bank of America (BAC) has spent on disputes stemming from the 2008 financial crisis. Marc Mukasey, a lawyer for Mairone, called his client a “woman of integrity, ethics and honesty,” adding they would fight on. “She never engaged in fraud, because there was no fraud,” he said. Wednesday’s verdict was a major victory for the Justice Department, which has been criticized for failing to hold banks and executives accountable for their roles in the events leading up to the financial crisis. The government continues to investigate banks for conduct related to the financial crisis. The verdict comes as the government is negotiating a $13 billion settlement with JPMorgan Chase (JPM) to resolve a number of probes and claims arising from its mortgage business, including the sale of mortgage bonds. The lawsuit stemmed from a whistleblower case originally brought by Edward O’Donnell, a former Countrywide executive who stands to earn up to $1.6 million for his role. The case centered on a program called the “High Speed Swim Lane” — also called “HSSL” or “Hustle” — that government lawyers said Countrywide started in 2007. The Justice Department contended that fraud and other defects were rampant in HSSL loans because Countrywide eliminated loan-quality checkpoints and paid employees based on loan volume and speed. The Justice Department said the process was overseen by Mairone, a former chief operating officer of Countrywide’s Full Spectrum Lending division. Mairone is now a managing director at JPMorgan. About 43 percent of the loans sold to the mortgage giants were materially defective, the government said. Bank of America bought Countrywide in July 2008. Two months later, the government took over Fannie and Freddie. Bank of America and Mairone denied wrongdoing. Lawyers for the bank sought to show the jury that Countrywide had tried to ensure it was issuing quality loans and that no fraud occurred. The lawsuit was the first financial crisis-related case against a bank by the Justice Department to go to trial under the Financial Institutions Reform, Recovery and Enforcement Act. The law, passed in the wake of the 1980s savings-and-loan scandals, covers fraud affecting federally insured financial institutions. The Justice Department, and particularly lawyers in the office of U.S. Attorney Preet Bharara in the Southern District of New York, have sought to dust off the rarely used law and bring cases against banks accused of fraud. Among its attractions, FIRREA provides a statute of limitations of 10 years and allows the government to bring civil cases for alleged criminal wrongdoing. Gibson and other lawyers say any appeal by Bank of America would likely focus on a ruling made by the judge before the trial that endorsed a government position that it can bring a FIRREA case against a bank when the bank itself was the financial institution affected by the fraud. The case was one of three lawsuits in New York where judges had endorsed that interpretation. Banks have generally argued that the interpretation is contrary to the intent of Congress, which they said is more focused on others committing fraud on banks. “This office will never hesitate to go to trial to expose fraudulent corporate conduct and to hold companies accountable, particularly when it has caused such harm to the public,” Bharara said. Edwin Gonzalez’s wife Lillian is the one who fell in love with the home. “Since she was a little girl, she’s always wanted a Victorian,” he explained. It was Thanksgiving 2008 and Lillian’s sister sent her the Gardner, Mass., listing. Three days later, Edwin and Lillian went to see the home. They bought the home and moved in about six months later. That’s when they started hearing rumors about the stately Victorian. Apparently, their dream home was haunted. The home is known as “The Victorian.” A gorgeous and enormous estate, it was built by furniture maker S.K. Pierce in 1875. With bay windows, intricate woodwork and a mansard roof, the house is a prime example of the period’s Victorian architecture. Nonfiction author Eric Stanway has written a book about the home’s history, which he believes could be the cause of purported ghost sightings on the property. The first owner, Pierce, moved into the home with his family and shortly after, tragedy struck. His wife died suddenly of a bacterial disease, and he remarried another woman, Ellen, 20 or so years his junior. The age difference didn’t sit well with Pierce’s son, Stanway says. As a result, Ellen inherited the property instead of Pierce’s son. Following her death, Ellen’s son, Frank, took over the home in the 1900s. Frank, however, reportedly lost the entire estate in a card game, though he was allowed to remain living in the basement. “He’s one of the ghosts,” explained Stanway. There are other rumors of unhappiness in the home, says Stanway. A girl drowned in the pond out back and at one point, the home reportedly operated as a brothel and one of the women working there was murdered in an upper bedroom. Another resident, a Finnish immigrant, fell asleep while smoking and burned to death. The home at one point was slated to be torn down, not because of ghost activity, but for another issue. The house had not been updated for some time and at one point, stood vacant for 20 years. Yet after the home was condemned, the city of Gardner didn’t have the funds to go through with demolition. The house ended up selling to another buyer. A younger couple, Stanway says, bought it with plans to fix it up. But the new owners only lived there a few years before moving out. Again, the home was vacant until Gonzalez and Lillian decided to buy in 2008. Ghost ‘Sightings’: Gonzalez says he knew nothing of the home’s history when he moved in, but from Day One, he’s reported odd things happening: an enormous potted plant tipping over for no reason, shadowy figures, footsteps, and a glass ornament that was moved from the mantle to rest exactly in the middle of the floor several times. But it wasn’t until Gonzalez saw his first ghost that he started to believe that the home was more than just a bit odd. Prior to that, he dismissed any haunting story. Around the same time, a new neighbor stopped by asking Gonzalez if one of his kids could play. Gonzalez and Lillian don’t have children. But the neighbor claimed to have seen a small boy several times in the window. Unbeknownst to Gonzalez, Lillian was having her own strange experiences, which culminated one morning. Lying in bed, Lillian said she felt a sudden pressure on her chest and lungs, making it impossible to move. That moment in 2011 scared both Gonzalez and Lillian enough that Gonzalez decided it was time to move out. Gonzalez says that they haven’t really been back since, other than to host the occasional ghost tour. Today: Gonzalez and Lillian still own the home and have had it featured on a few ghost hunter TV shows. This fall, they’re offering ghost tours of the home with benefits going to the American Cancer Society’s Relay for Life. Despite their experiences, Gonzalez is unsure about selling. They still love the home and see its potential. “It’s still Lillian’s dream to fix it up,” he says. For now, they’re holding onto it — living in an apartment, while deciding whether the ghostly property is worth the investments. 10 of the Most Haunted Homes in the U.S. Houses Michael Jordan’s Home Auction: Best Shot for a High-End Property? 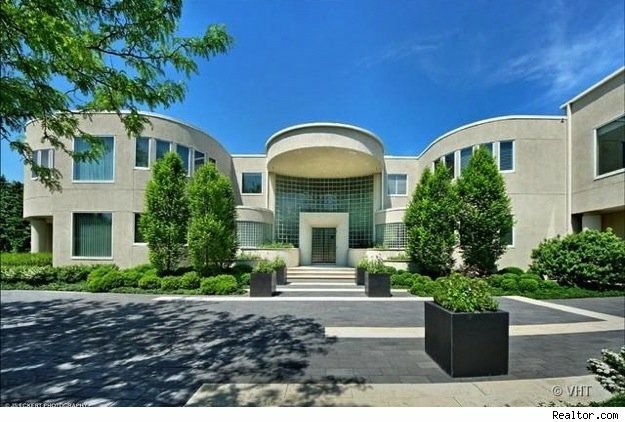 Michael Jordan’s suburban Chicago mansion is up on the auction block — not because of foreclosure or bankruptcy, but perhaps because selling a home via auction seems to be an emerging trend in the luxury real estate market. “Instead of being at the mercy of the market and waiting for buyers to make offers, the sellers are able to name the date of their sale and the format, and they don’t have to deal with any negotiations,” Laura Brady, president of Concierge Auctions, which is handling the basketball star’s home sale, told AOL Real Estate. Although many may think auctions are for collectibles, fine art, and distressed or bank-owned properties — such as the former Versace mansion that sold at auction last month for $41.5 million — home auctions actually have been a growing choice for those selling real estate, especially sellers of unique, high-end properties who want to take control of the sale process, say leaders in the auction industry. Among the advantages: Properties can be sold “as-is,” and with no financing contingency, no post-auction inspection period, etc. There’s no minimum opening bid for Jordan’s 56,000-square-foot compound, but potential buyers of the former NBA superstar’s estate, which is being sold furnished, do have to put down a deposit of at least $250,000 just to qualify to participate in the home auction. The mansion, pictured above and in slideshow below, features nine bedrooms, 15 bathrooms and a regulation basketball court. The 7.39-acre property currently appears on the Multiple Listing Service priced at $21 million, down from last year’s list price of $29 million. Concierge Auctions, which has set Nov. 22 as the live auction date of Jordan’s “Legend Point” property, is one of a few companies operating in the luxury real estate auction space. It and competitors such as Grand Estates Auction Company prefer to hold auctions on-site because, they say, it creates a sense of urgency for potential buyers, as well as being expedient and transparent. Participants bid in person, with paddles, as one might at an antique-collectibles auction. Sometimes, however, buyers will bid over the phone. Grand Estates — which focuses exclusively on those properties — started in 1999 by auctioning off homes valued at $1.9 million and greater. Today the minimum value of a home has to be $2 million. A sister company, Interluxe, deals with lower-priced (but still high-end) homes. As AOL Real Estate has reported, there are even companies that help sellers of for-sale-by-owner properties auction off their homes. “We were the first to enter the luxury real estate business,” says Grand Estates President Stacy Kirk Reich, who co-founded the company with her mother after one of their own properties sat on the traditional market a bit longer than they would have liked. Concierge began in 2005. At the same time, says Reich, buyers were assured that they weren’t paying too much because they knew what the next closest offer was. The live, in-person auction process provides a layer of transparency that one does not find in closed bidding, in which each potential buyer puts in an offer above the reserve or list price, and they have no idea what the other buyers are willing to pay. Jordan still has business interests in Chicago, including his restaurants. “Chicago will always have a piece of my heart,” said the basketball legend, who now lives in his home state of North Carolina. If you live in a city or county with high rates of home abandonment and foreclosure, you may be able to get a good deal on a new home, either for your primary residence or as an investment property. In areas where high rates of home abandonment and foreclosure have become a huge problem, land banks are becoming a popular solution. These are organizations, typically run by the local government, that focus on acquiring and then reselling abandoned houses and lots. Land banks are revolutionizing the way cities deal with abandoned or foreclosed properties, which have traditionally taken years to acquire, clean up and resell. Since the recent mortgage crisis, more and more cities have been opening land banks as they deal with huge numbers of abandoned, foreclosed properties. Rather than letting abandoned homes drag down property values, reduce tax revenues and generally become a burden, local land banks are working to encourage homeownership, especially in urban areas with high rates of abandonment. Land banking is an interesting phenomenon, but what does it mean for you and your homebuying journey? Well, depending on where you live, you may be able to get an excellent bargain on an abandoned home with “good bones” or excellent redevelopment potential. How the purchase process works. So how do you purchase a home from a local land bank? The short answer: It depends. Different land banks have different rules and ways of operating, so the main thing is to check with your local land bank. Some land banks sell primarily to nonprofits, while others open up sales to for-profit developers. Often, nonprofit community development corporations (CDCs) work in tandem with their local land bank to acquire properties cheaply. These CDCs then renovate the properties and sell them at a still-discounted rate to individual homebuyers. If you’re interested in affordable housing but don’t want to do the renovation that land-banked homes often require (because they’ve often been abandoned for years), check out local CDCs to see about affordable housing opportunities in your area. Other land banks sell directly to individual buyers in certain circumstances. Be aware, though, that land bank properties – particularly those in the most desirable conditions and locations – tend to sell quickly. So if you plan to buy a land-banked home on your own, be prepared to move quickly. Genesee County Land Bank (Michigan): The Genesee County Land Bank, one of the oldest in the country, has a residential buying program that allows individuals to by land-banked homes. Although many of the county’s properties need heavy renovation, some of the featured homes (which will, of course, have a higher purchase price) do not. To buy a home from this land bank, you’ll need to meet certain down payment requirements, and you’ll need to fill out the Residential Property Interest Application to begin the purchasing process. Dallas Land Bank (Texas): The Dallas Land Bank focuses on getting primarily empty lots to for-profit and nonprofit developers. These developers have to have built at least three housing units in the three years preceding their land bank purchase. The Dallas Land Bank sells lots for about $4,500 each, and developers have to complete a proposal for the land bank property and be approved by the land bank board and city council before purchasing lots. Individuals in need of affordable Dallas housing should check with local nonprofit developers who specialize in buying and developing land bank properties. Cuyahoga County Land Bank (Ohio): The Cuyahoga Land Bank, which includes Cleveland, lets owner-occupants buy homes in need of renovation for as little as $4,000. The land bank also runs a fixer-upper loan program, so buyers can access funding to complete necessary repairs on homes they buy from the land bank. Under Cuyahoga’s Owner Occupier Advantage Program, owner-occupants have a 30-day opportunity to purchase homes that need moderate work before developers can jump on the properties. Owner-occupants have to go through the bidding process, agree to complete certain renovations and agree to live in the home for at least three years to qualify for this program. As you can see, land bank procedures vary dramatically from one land bank to the next. But as more and more cities and counties open land banks, it’s worth a Google search to see if your city has a land bank program that could help you pick up a new home for a rock-bottom price. The ghosts and goblins in our homes might be more than Halloween decorations fashioned from scissored bed sheets and carved pumpkins — so say a large number of those recently surveyed about living in a haunted house. According to the poll by Realtor.com, more than a third of the consumers it questioned reported living in a haunted house, or at least in one that they suspect might be. And 63 percent said that they either would be willing to buy a haunted house or at least consider it — though far fewer would pay full market value. 2013’s Haunted Housing Report from the real estate listing and news site asked 1,400 consumers a few weeks ago a variety of questions about their experiences with and attitudes toward haunted real estate. Among the “warning signs” of a possible haunting: 61 percent cited a cemetery on the property; 50 percent, a home being at least a century old; while 45 percent said a very low price and a quick change of ownership. Close proximity to a battlefield was a concern for 43 percent. Of those who would buy a haunted home, many said they’d only do so at a deep discount. Such a home would have to have a purchase price greater than a 30 percent, said 41 percent of the respondents, before they’d even consider buying one. But don’t bank on deciding once you’re ready to buy. Chances are you will not know that a house is haunted, because in most states the seller will not have to disclose purported paranormal activity — as seller disclosures tend to focus on the structural issues of the home. The main way to find out: “Do your homework about the property. Go poke around the neighborhood. Ask questions,” says Leslie Piper, a consumer housing specialist for Realtor.com who is also a licensed San Francisco Bay-area agent. Piper told AOL Real Estate that she once bought a haunted house without realizing it. Although she never saw a ghost or spotted levitating objects, Piper says she did have eerie feelings about her Victorian home and had a reputed expert in such matters burn sage there as a way of removing the spirit. Others, meanwhile, relish the possibility of a haunted encounter. 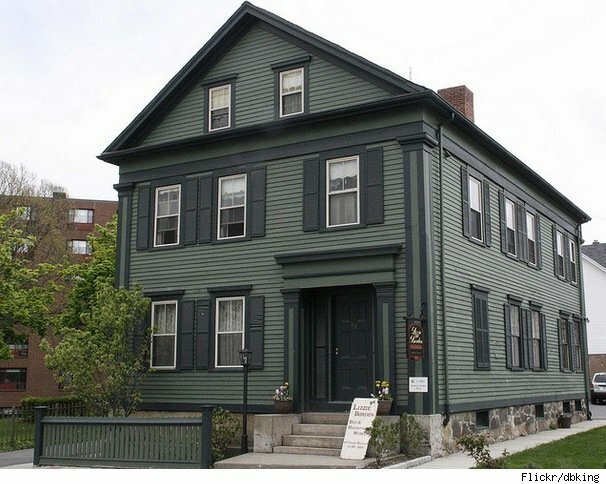 The owners of purported axe murderer Lizzie Borden’s former home (pictured above), where she reputedly killed her parents, rents as a bed and breakfast for those hoping to spot the ghosts of Andrew and Abby Borden wandering the grounds. The limestone ruins look ancient, like something abandoned by its residents hundreds of years ago along a misty loch in Scotland. The property, however, is not across the Atlantic but in upstate New York, most fittingly located in the town of New Scotland. The ruins are not as ancient, either. The estate at 104 Helderberg Castle Road was built in 1935 by the reclusive Bouck White, a potter and Socialist activist. Located on 4.5 acres, the property also includes a contemporary 2,500-square-foot home, but the castle ruins, a pottery studio and various other outbuildings are the most intriguing selling points. The number of distressed properties last month decreased 27 percent from September 2012, with a little less than 1.3 million properties in some stage of foreclosure (default, auction or bank owned). That’s one in every 998 homes in foreclosure across the nation. Data from real estate site RealtyTrac showed that while foreclosures were up 2 percent from August, filings have continued to fall over the course of this past year. Prices of those foreclosed homes have also declined, in conjunction with rising values of non-distressed properties, resulting in a more significant discount. In August, the most recent sales data available on RealtyTrac, the discount on foreclosed homes was 39.5 percent, or an average of $73,900. That’s an increased discount of $3,900 (5.6 percent) from last year, at a median sale price of $113,000. The median sale price for a non-distressed property in August was $186,900. But the news isn’t good everywhere. Foreclosure activity spiked 104 percent in Nevada from July to August, as it overtook Florida as the state with the most foreclosures. It remained on top in September with activity increasing 44 percent from August. With 1 in every 249 properties in foreclosure, Nevada’s foreclosure rate is up 97 percent from September 2012. Florida, Illinois, Maryland and New Jersey join Nevada as the five states with the highest foreclosure rates. In June, 1 in every 328 Florida homes had a foreclosure filing, and the rate has declined to 1 in 406 in September. Below, AOL Real Estate has selected a gallery of higher-end foreclosed homes that are for sale in the 10 states with the most foreclosures on the market, as of September.